Apple continued with its series of word-association iPad ads on Sunday night, airing a 30-second movie-themed commercial during the Academy Awards. 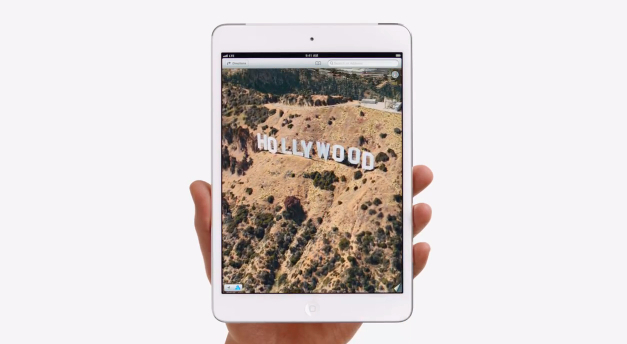 Hollywood (below) is a high-speed, colorful affair highlighting a selection of apps available for the iPad – both large and mini. Coincidentally, one of its featured apps happens to be 8mm Vintage Camera, the $1.99 app that helped Malik Bendjelloul’s complete the filming of Searching for Sugar Man and subsequently take home the Oscar for best documentary. Of course, Samsung wasn’t going to simply sit by and let Apple steal the limelight. Frankenweenie director Tim Burton was batting for the Korean tech giant in an ad (below) featuring him meeting folks from a gaming company to talk about making a movie version of the zombie-themed fictional game ‘Unicorn Apocalypse’. “Zombie unicorns on one side, what’s left of humanity on the other,” says Burton as he lays out his vision for the movie. There’s talk of unicorn blood (which is apparently rainbow-colored with little weird sparkles in it), eyes bulging out of heads and planets smashing into things before Burton utters something you wouldn’t ordinarily expect him to say. Oh, and the ad’s for the Galaxy Note 10.1.